Mildred A. West passed away peacefully on Wednesday, September 5, 2018 at the age of 93. Graduated from Tottenville High School, Mildred attended Northwestern Bible College in Minneapolis and then onto NYU in Manhattan. She retired as an administrator in the Secretary’s Office of the International Nickel Company in 1984. After retiring from the business world, she worked as a teacher’s assistant in the New Dorp Baptist Nursery school for six years. She was a dedicated member of the Bayview Chapter of the Order of the Eastern Star and was a Past Grand Officer and was also a treasurer of her chapter for over sixty years. Mildred also attended Calvary Chapel in Mariners Harbor. 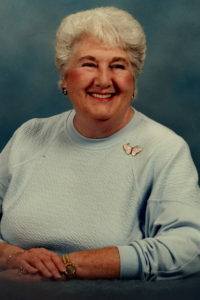 She loved to sing, dance, read and watch television especially game shows. She will be deeply missed by all who knew her. Mildred is survived by her loving sister, Elaine Garzetta and her beloved niece, Leslie Larson and nephew David Garzetta, as well as a grand-niece and 1 great grand niece. We were saddened to hear of Mildred’s passing. May our Lord comfort each of you during this difficult time. Our prayers will follow you as you lay your dear Sister and Aunt to rest.